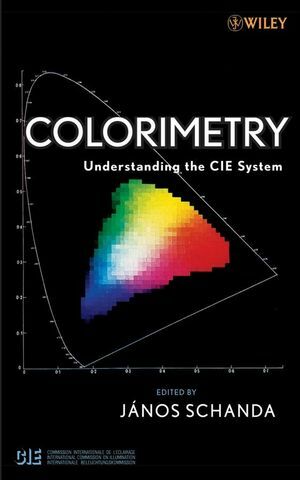 Colorimetry: Understanding the CIE System summarizes and explains the standards of CIE colorimetry in one comprehensive source. Presents the material in a tutorial form, for easy understanding by students and engineers dealing with colorimetry. Provides an overview of the area of CIE colorimetry, including colorimetric principles, the historical background of colorimetric measurements, uncertainty analysis, open problems of colorimetry and their possible solutions, etc. Includes several appendices, which provide a listing of CIE colorimetric tables as well as an annotated list of CIE publications. Commemorates the 75th anniversary of the CIE's System of Colorimetry. Janos Schanda, PhD, is Professor Emeritus of the University of Pannonia in Hungary, where he taught colorimetry and visual ergonomics. He headed the Department of Image Processing and Neurocomputing between 1996 and 2000, and served as secretary of the CIE. He is a member of the advisory boards of Color Research and Application, Lighting Research and Technology, Light and Engineering, and Journal of Light and Visual Environment. 1. Translation of CIE 1931 Resolutions on Colorimetry (Translated by P. Bodrogi). 2. Professor Wright’s Paper from the Golden Jubilee Book: The Historical and Experimental Background to the 1931 CIE System of Colorimetry (W. D. Wright). 3. CIE Colorimetry (János Schanda). 4. CIE Color Difference Metrics (Klaus Witt). 5. Spectral Color Measurement (Yoshi Ohno). 6. Tristimulus Color Measurement of Self-Luminous Sources (János Schanda, George Eppeldauer, and Georg Sauter). 7. Color Management (Ján Morovic and Johan Lammens). 8. Color Rendering of Light Sources (János Schanda). Part III: Advances in Colorimetry. 9. Color-Matching Functions: Physiological Basis (Francoise Vienot and Pieter Walraven). 10. Open Problems on the Validity of Grassmann's Laws (Michael H. Brill and Alan R. Robertson). 11. CIE Color Appearance Models and Associated Color Spaces (M. Ronnier Luo and Changjun Li). 12. Image Appearance Modeling (Garrett M. Johnson and Mark D. Fairchild). 13. Spatial and Temporal Problems of Colorimetry (Eugenio Martinez–Uriegas). 14. The Future of Colorimetry in the CIE (Robert W.G. Hunt). Appendix 1: Measurement Uncertainty (Georg Sauter). Appendix 2: Uncertainties in Spectral Color Measurement (James L. Gardner). Appendix 3: Use of CIE Colorimetry in the Pulp, Paper, and Textile Industries (Robert Hirschler and Joanne Zwinkels). Appendix 4: List of CIE Publications.